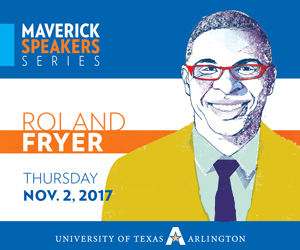 Claim your tickets to see Roland Fryer—award-winning Harvard economist, education activist, and 1998 UTA graduate—at the Maverick Speakers Series event at 7:30 p.m. Thursday, Nov. 2, at Texas Hall. Dr. Fryer will discuss Solutions to Fixing Education in America: No More Excuses. An autograph signing will follow his talk. Tickets are required. Students can claim two free tickets or purchase the VIP or preferred seating packages at uta.edu/maverickspeakers. Think your class load is scary? Try these stress-busting, fun, and free events. Halloween Trick-or-Treat at the College of Business, 10 a.m.-4 p.m., Business Building. Costumes encouraged. The FabLaboratory, 11 a.m.-2 p.m., FabLab, Central Library. Carve pumpkins, build candy caskets, paint your face, and more. Refreshments provided. Costumes encouraged. Halloween Boo-haha with the College of Education, 2-4 p.m., Hammond and Trimble halls. Costumes encouraged. ARToberFest, 3-5 p.m., CAPPA/architecture courtyard. 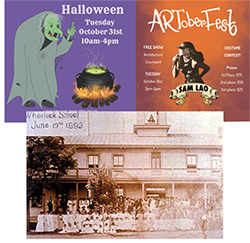 Art, music featuring alumna Sam Lao, and a costume contest with cash prizes. Wheelock Academy: A Native American Paranormal Documentary, 7 p.m., Rosebud Theatre, University Center. The film looks at hauntings at an infamous Anglo school for Native Americans. Maverick pride will cover the community as UTA celebrates Homecoming 2017 Nov. 5-12. The schedule of events includes volleyball and basketball games, a street festival, a parade, and a 5K walk and run. Your student group is encouraged to enter a float, golf cart, or walking entry in the UTA Goes Hollywood Homecoming Parade. Prizes of $250 and $100 will be awarded to the first and second place entries, respectively, in the departmental and student organization categories. 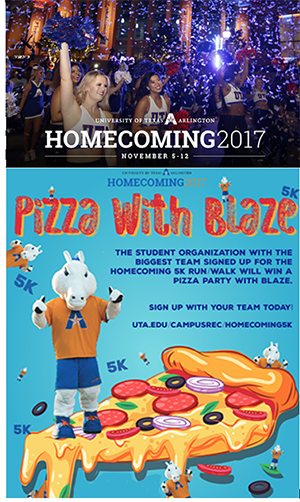 Go to uta.edu/homecoming for entry form, rules, and regulations. Homecoming Parade—Register by Oct. 31. Event is Nov. 11. 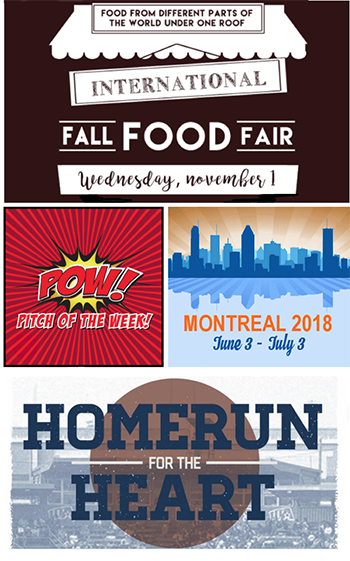 Homecoming Chili Cook-off—Register by Nov. 3. Event is Nov. 8. The Bash—Tickets $12 by Nov. 4, $15 by Nov. 5-9. Event is Nov. 9. Homecoming Step Show—Tickets $12 by Nov. 4, $15 by Nov. 5-10. Event is Nov. 10. The UTA Police Department seeks your opinion regarding its performance in serving the community. 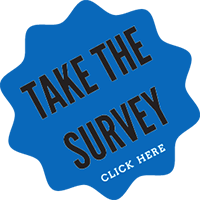 The UTA PD survey will remain open until Dec. 8. Your time and input will help UTA PD enhance its professionalism and the services provided to students, faculty, staff, and visitors. The Follett Student Leadership Center and Tri-C Campus Ministries are accepting donations for the UTA Food Pantry for students. Non-perishable food items can be dropped off at the front desk of the Maverick Activities Center, Room 203 of Carlisle Hall, Room 508A of Hammond Hall, and the Arlington Regional Data Center. 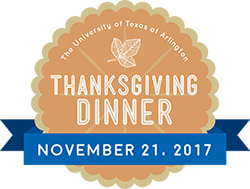 A new Maverick tradition, UTA's Thanksgiving dinner is a chance to share fellowship and gratitute. The meal is 5-8 p.m. Tuesday, Nov 21, in the Connection Café in the University Center. The meal is free for students with a meal plan. Tickets are required for others: $5 for students and $8 for faculty, staff, and friends. Receive a free meal by volunteering. LEARN MORE. Apply to serve as a New Maverick Orientation Leader by Nov. 3. Applications for student representative on the UT System Board of Regents or the Texas Higher Education Coordinating Board are due Nov. 11. Submit an entry for the scholarship essary contest in the Arlington Martin Luther King Jr. "Advancing the Dream" Celebration byNov. 28.